Roethling has an extensive background in public horticulture and landscaping spanning nearly 30 years. At High Point University, he guided the establishment of several important plant collections, developed new garden spaces and led the renovation of nearly all existing campus gardens. 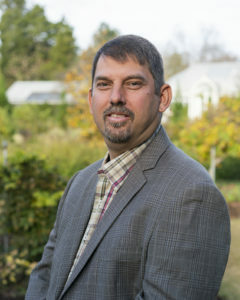 Prior to his position there, Roethling was a research technician and horticulture assistant for several years at the JC Raulston Arboretum at North Carolina State University, his alma mater. He credits his time there as central to igniting his passion for public horticulture, and for establishing his extensive network of professional relationships in the field. At Reynolda, Roethling will join the senior leadership team under Perkins’s direction, and manage a team of five professional staff members and a dedicated volunteer group who care for 129 acres that include formal gardens, a conservatory, wooded walking trails, vast lawns and wetlands. Originally designed by Thomas Sears utilizing a site plan by Louis L. Miller and Horatio R. Buckenham, the gardens and landscape are used for recreation and respite by thousands of visitors each year and serve as a place of academic research and exploration for university students. With hundreds of plant varieties, flowering across the estate begins in late winter and continues until frost. The formal gardens, located between Reynolda House and Reynolda Road, have been open to the public continuously for more than 100 years. Roethling has lectured widely to garden clubs and groups across North Carolina and recently presented at the American Public Gardens Association Conference. He is a past president and current member of the Guilford Horticultural Society and is the author of numerous articles and research papers. He says he is excited about integrating all of what makes Reynolda a unique, welcoming place. Public horticulture is a shared passion between Roethling and his wife of 15 years, Adrienne, who is the director of curation and mission delivery at the Paul J. Ciener Botanical Garden in Kernersville. They spend much of their free time in the garden and traveling to other public gardens, and they enjoy volunteering with Blue Ridge Boxer Rescue.